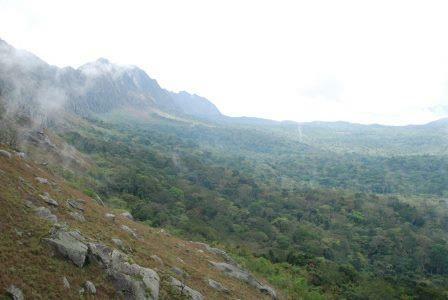 The central escarpment forest in Angola, with Kumbira Forest as its key site, is one of the most important areas for biodiversity in the country especially for threatened endemic birds. Nevertheless, human activities, especially slash-and-burn agriculture, are threatening these species. Our main objective is to build awareness among the local population and government and start conservation action in Kumbira by assessing economic alternatives that will allow populations and forest habitat to recover. Specifically, we will continue to advise local government, study local coffee markets and production potential, establish a community campsite and tourism website, employ tested methods to establish a nursery of indigenous forest trees, and run adult and school education programmes in local villages. We expect that the project will help to make the government and population more aware of the importance of Kumbira Forest and its biodiversity. Furthermore, the local population will have viable economic alternatives that do not destroy the forest and we will be able to start recovering forest through reforestation. Overall this project will contribute to our main goal, which is to ensure that these forests persist by establishing a formal protected area.